So just like Robot below, Hellboy here was drawn for an art jam. Jesse Munoz at jessemunoz.com organized the whole thing over on deviantart. Follow my link to my deviantart page over on the right to get there quick! I've always been a pretty big Hellboy fan. I love the tales Mike Mignola puts Hellboy through as he spins plots out of mythology and folklore, with a healthy dose of '30's pulp and Kirby Krackles! 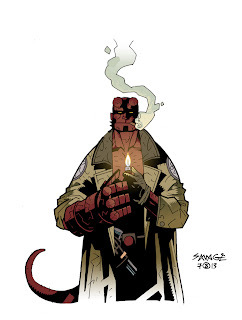 Recently they published the Hellboy Companion, and it is a MUST READ for fans of Hellboy.